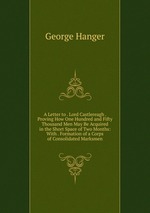 Аннотация к книге "A Letter to . Lord Castlereagh . Proving How One Hundred and Fifty Thousand Men May Be Acquired in the Short Space of Two Months: With . Formation of a Corps of Consolidated Marksmen"